The Sony SmartBand is the brand's latest contribution to the wearable tech world, currently populated by the Sony Smartwatch 2, Samsung Galaxy Gear and Google Glass. We've already taken a look at the LG Lifeband Touch, also unveiled at CES, but what makes Sony's wristband different? Designed as part of a "SmartWear Experience", the SmartBand is powered by the Sony Core tracker. It's not just a fitness gadget, like the Nike+ Fuelband SE, Fitbit Flex and Jawbone Up - it also takes note of other things like how long you've slept, what pictures you've taken and when (and where), what videos you've watched, who you've spoken to and what games you've played. The result is that you can "watch your lifestyle played back to you on screen" via the Lifelog app, says Sony. The idea is that it will make suggestions such as getting more sleep, or taking some exercise, or of course if you're particulalry narcissistic you can just use it to constantly review your terribly exciting life. The Core is a tiny plastic unit with an accelerometer inside. It sports a mini USB port and also features LED lights and a vibrate function to alert you to any notifications from your phone. The SmartBand wriststrap is a comfy rubberised, waterproof band which is adjustable and comfy to wear (for the short time that we had to look at it). 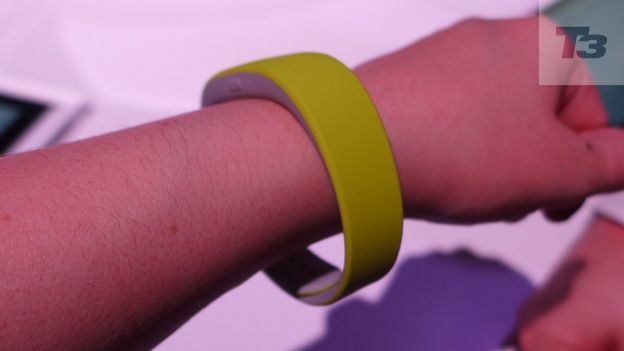 Sony showcased the SmartBand in three colours at CES - black, white and yellow. The Core simply pops into the SmartBand. The idea is that Sony will launch further accessories enabling the Core to be worn in different ways such as on a belt or round the neck. Although we didn't very long to look at the SmartBand and Core, we liked the design and the feel of the device on our wrist. The amount of data the app collects and how it's used raises important questions over privacy, but it's a certainly a compelling product that we look forward to seeing in action. Stay tuned for a full review.